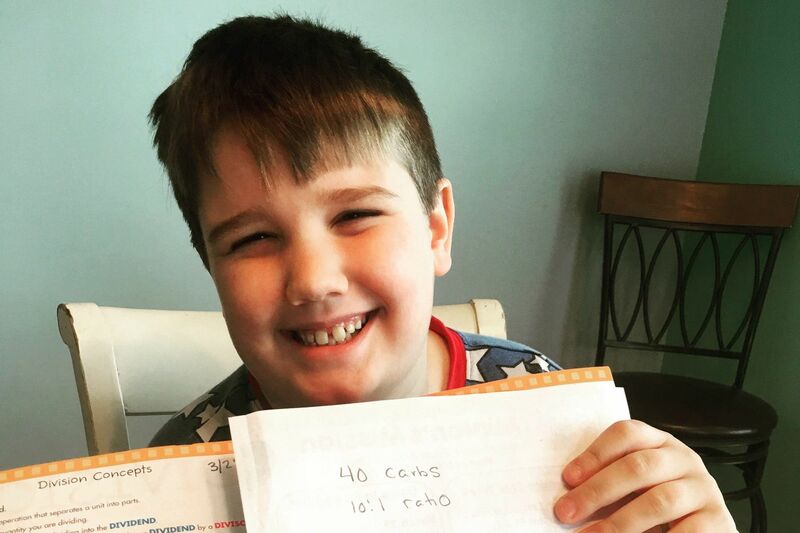 Shane Butcher, 10, of Egg Harbor Township, NJ, practices math by calculating carbs, which he needs to learn so he can manage his type 1 diabetes. Liz Parlett Butcher opened her mailbox earlier this week to find a letter she never thought she'd lay eyes on. UnitedHealthcare, which manages the family's Medicaid plan, wrote to say that Butcher's 10-year-old son Shane was approved for his current brands of insulin for the next 20 years. A July story in the Philadelphia Inquirer chronicled the Butchers' experience with this system — which included a scary episode of dangerously low blood sugar levels when Shane, who has type 1 diabetes, was switched to a different brand of long-acting insulin. Shortly after the story was published, Butcher said a representative from UnitedHealthcare contacted her and promised that Shane would never be required to switch insulin brands again. After a few follow up calls about the conversation, the Butchers received the promise in writing, in letters dated Aug. 31. "I'm elated that we're not going to have to go through that horrible experience again," said Butcher, who lives with her husband and four children in Egg Harbor, N.J. The two letters say that Shane is approved for Lantus and Novolog, two insulins, through 2039. "We are focused on serving people and have been working closely with Shane Butcher's family to ensure coverage is available for medically appropriate treatment," said Jocelyn Parker, a UnitedHealthcare spokeswoman, in a statement to the Inquirer. Shane had been stable on Lantus, a long-acting insulin. Last summer, UnitedHealthcare's drug formulary changed — Basaglar was the plan's preferred brand and Shane had to try it before the plan would agree to instead pay for Lantus. United Healthcare told the Inquirer in July that the approach is intended to stem rising drug prices. The insurer negotiates deals with certain drug makers to offer those medications at a lower cost. Medications are only swapped out for alternatives considered clinically equivalent, with the same active ingredients. Basaglar, a newer insulin, is considered clinically equivalent to Lantus. Such brand changes do not have a significant effect on most patients, but adverse reactions can happen. Shane had previously had a negative reaction when his short-acting insulin was switched, so his doctors requested he be allowed to remain on Lantus, but to no avail. Only after a couple incidents of very low blood sugar was Shane allowed to switch back to Lantus. Still Butcher worried that it would only be a matter of time before Shane's insulin brand was switched again. The 20-year guarantee from UnitedHealthcare is a relief, Butcher said, but she worries about families that aren't able to stand up to insurance companies or have their story told in the press. "It's so incredibly sad to me that it took me contacting the Philadelphia Inquirer to have a story run to expose their behaviors instead of addressing our concerns initially," she said.